I'm setting up this column to act as a clearing house for information on The War Libraries book written by myself and David Roach. Over time I will be including various items, including reviews, additions & corrections and links to related subject matter that has appeared in Bear Alley or elsewhere. The book is available from Amazon.co.uk (see the "New or Used" section for the cheapest price) or directly from the publisher. There's a permanent link to this column on the right. 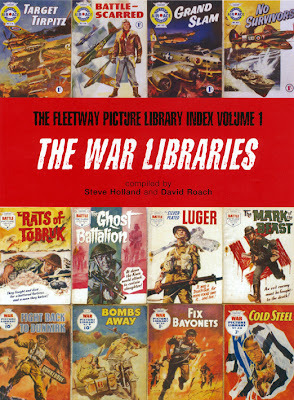 Published by The Book Palace in August 2007, The War Libraries is the first of a three-volume series that will also include The Thriller Libraries (covering Cowboy/Thriller/Super Detective) and Romance and Adventure Libraries (covering adventure, romance, schoolgirls and other genre picture libraries from Lion and Valiant PLs to True Love and School Friend). This title covers the contents of Air Ace, Battle, Giant, War and War at Sea picture libraries plus related Holiday Specials, some 4,500 titles in all. Where possible we have identified the artists, scriptwriters and cover artists, titles of back-up strips and reprint information where titles had been previously published. The book is 194 pages with stitch binding and a flexiback cover. There are two 16-page colour sections reproducing some of the best of the original artwork and the first 50 issues issues of Air Ace and Battle and the first 100 issues of War Picture Library. The book is heavily illustrated with examples of interior artwork, covers and advertising material. The book has a 10,000 word introduction and even includes photographs of some of the staff who worked on these titles. With thanks to Jeremy Briggs, Jan Roar Hansen, François San Millan, Paolo Peruzzo, Jose Manuel Ruiz, Hans van Maar and Diego. Air Ace 64: Aldo Di Gennaro is mis-spelled Gernaro and additionally mis-spelled Gernnaro elsewhere (Air Ace 132, 133). The cover for AA64 is by Aldo Di Gennaro. Air Ace 262: the correct title is 'Duel in the Sky'. Air Ace 280: the correct title is 'Sky Wolves Go To War'. Air Ace 300: Art: Aldo Marcuzzi? Air Ace 305: Art: Aldo Marcuzzi? Air Ace 312: Art: Aldo Marcuzzi? Air Ace 316: Art: Aldo Marcuzzi? Air Ace 320: Art: Allen Pollack. Air Ace 340: reprints WAR 145, Doodlebug. Air Ace 348: reprints BATTLE 77, Bomb Run. Air Ace 372: reprints WAR 181, Rogue Lancaster. Air Ace 376: thought to reprint WAR AT SEA 24, Flight Deck. Battle 50: Annibale Casabianca is mis-spelled Anibale here and in various other places (Battles 66, 93, and War at Sea 17, War 80, 356, 399). Casabianca is additionally mis-spelled as Cassabianca in three instances (War at Sea 17, War 356, 399). Battle 299: the artist is not F. Solano Lopez. Possibly a Spanish artist also called Lopez but otherwise unknown to us, almost certainly Antonio Lopez who drew war stories for Editorial Ferma in Barcelona. The same artist (see samples below) was responsible for Battle 328 and probably also Battle 315 and 342. Battle 493: the artist is probably Cesar Sapradi rather than Spaderi. Battle 625: cover by Graham Coton. Battle 836: + Desert Rat (add backup story). The same story that appeared in War 996? Battle 1008: + Cool Courage (add backup story); cover by Ian Kennedy. Battle 1151: + Play Safe and Die (add backup story). Battle 1355: + Man Of Honour (add backup story). Battle 1386: cover by Graham Coton. Battle 1393: + A Losing Battle (add backup story). Battle 1464: + Teamwork (add backup story). Battle 1468: + Nobody's Perfect (add backup story). 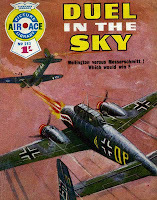 Battle 1675: reprints Air Ace 17, Gun Shock (add original title). Giant War 45: reprints Air Ace 17, Gun Shock (add original title). War 620: + Costello's Prize (add backup story). War 836: + The Viking (add backup story). War 863: + Jungle Secret (add backup story). War 1671: + Sniper's Debt (add backup story). War 1799: + Wages of War (add backup story). War 1802: + Target Trouble (add backup story). War 1807: + Advance Party (add backup story). War 1821: + Law of the Kukri (add backup story). War 1872: cover by Oliver Frey. War 1877: + Larkin's Luck, art by Ron Turner (add backup strip and artist). War 1882: + Last Train (add backup story). For additional corrections relating to Josep Marti, see here. Giorgio De Gaspari. Bear Alley.